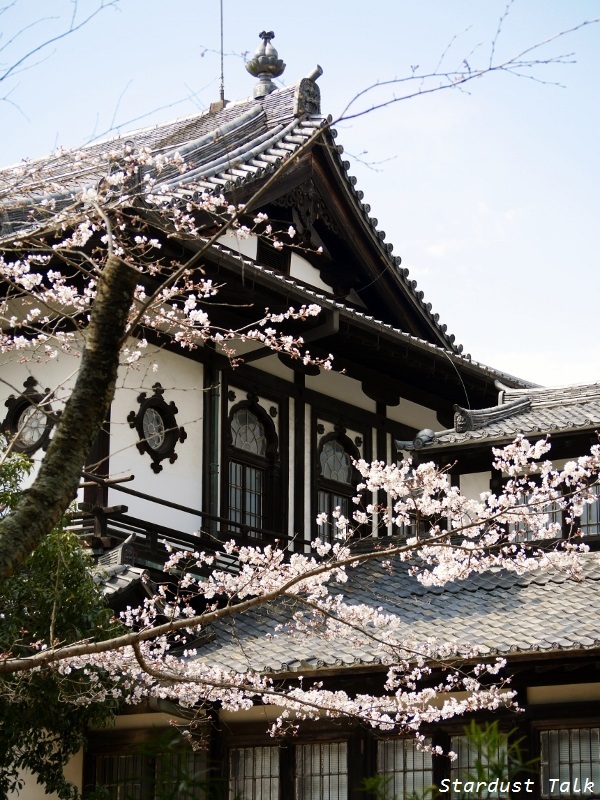 In Japan, Sakura, or cherry blossom, is more than just a beautiful tree blossom. It is the epitome of transient beauty in this world. 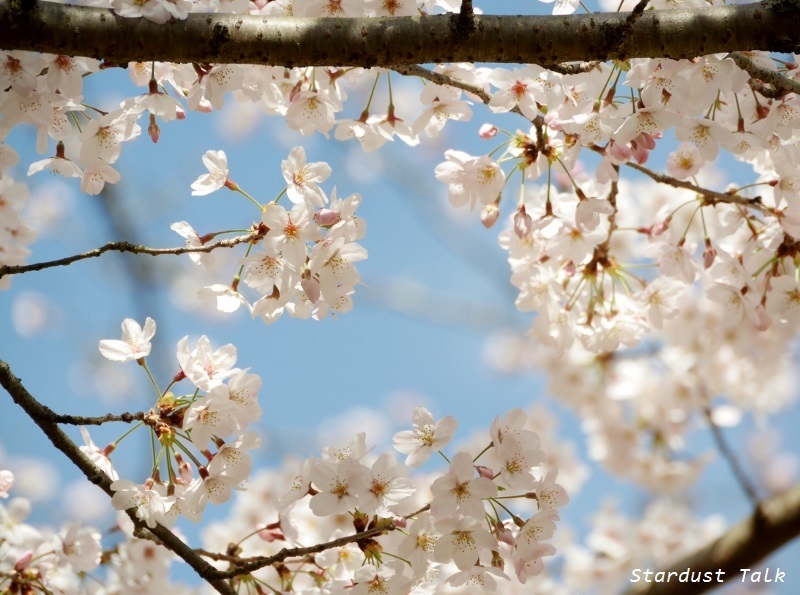 Though Sakura season lasts about two weeks, each blossom blooms less than a week. As we know, nothing in this world remains forever in the same way. So, let’s enjoy the beauty while it lasts, any moment of NOW. 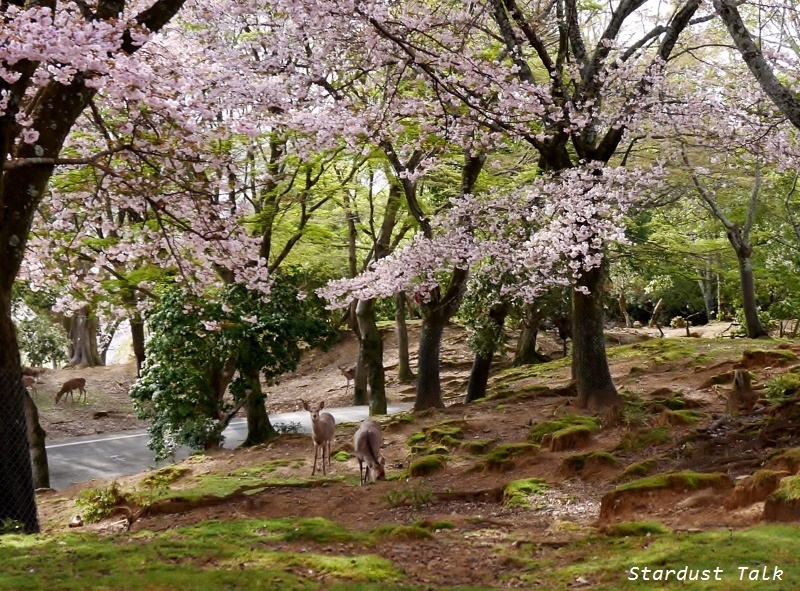 and sakura-colored carpet on the ground. including my father, who passed away on the 9th of April long years ago. “Live your life graceful to the fullest, treasure any moment of your life to the very end. When you live according to the will of Nature, everything will be all right." My second granddaughter Y arrived this world escorted by the Sakura spirit on the first of April. Today I accompanied Y to the entrance ceremony of the kindergarten ten days later her 3rd birthday. She is in the Dandelion class (three-year-old class) as the youngest of her classmates. Individual difference is so large at this stage of growth, but I think she'll be just all right being as she is. in each stage of her bloom. 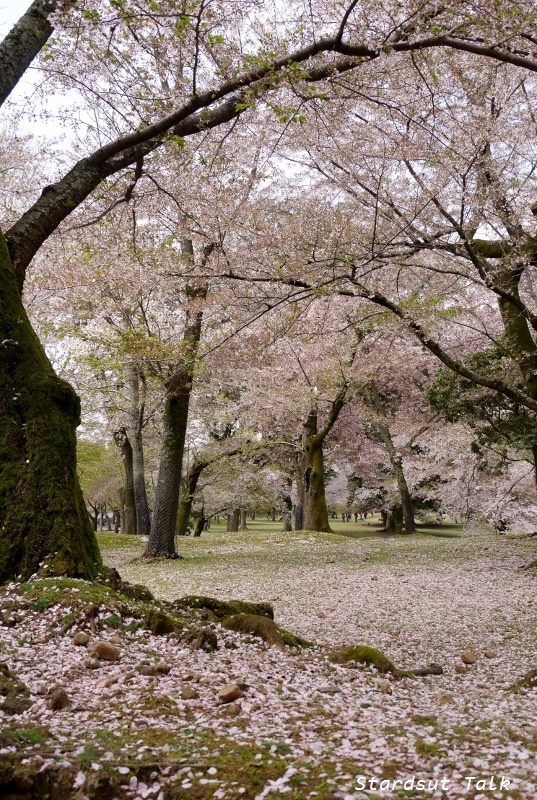 The Sakura Front is going north. My part of the world is entering The Season of "新緑 Shinryoku". 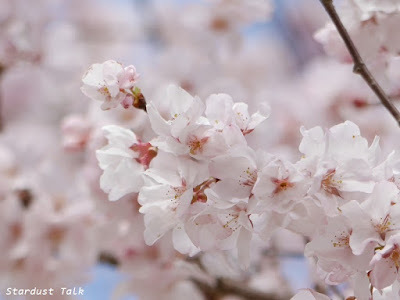 Dear Yoko, your photos, like the cherry blossoms, are a fresh breath of spring. They lift my spirit and fill my heart with joy. 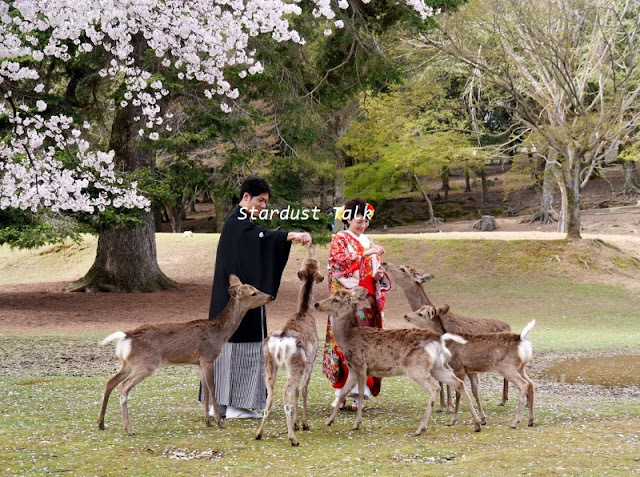 And all those tame deer...so delightful! Living in the NOW is so important and sometimes hard to do. Have you read the book, "The Power of Now." I need to read portions of it over and over to remind myself that the past does not exist and need no longer have any hold over me. The future also does not exist and may never occur. All we ever have is the present moment. And now, it is a moment to breath in the joyous scents of cherry blossoms! Amazing photos! They remind me that sometime we might experience Spring here someday soon. The Azaleas are beginning to bloom...a little late. It's raining today perhaps it will warm up tomorrow! Have a grand day! Your wonderful shots speak of a fairy tale world of beauty! Så underbara bilder från din fina park. Jag stornjuter av dom. Såg idag från bussen att våra träd börjar få ett rosa skimmer också men inte alls så mycket som hos dig. 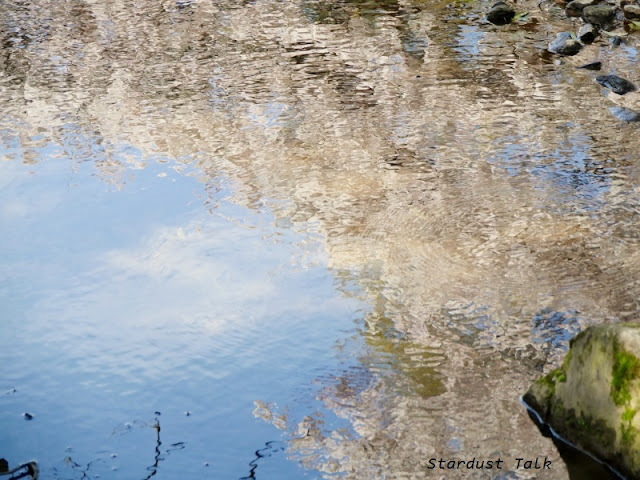 It is important to embrace natures beauty in the way you have done in this post Yoko showing the fleeting Sakura blossom, and enjoy it to the full during its short life. I hope your sweet little granddaughter is happy in the Dandelion class and that she makes lots of good friends. The beauty of your blog photos is overwhelming. I love all the blossoms but especially love the collage of your little daughter and your tender words. I love how the stages of children blooming is after flowers. I did not know that. She is so lovely. Congratulations on your second grand baby. I wish your family endless joy with your new family member. You gasp at how beautiful it is, it just takes your breath away! The two of us made this tour together with you again, domo arigato! Somehow I do not remember that path down to the Sagi-ike Pond. We haven’t walked there, have we? 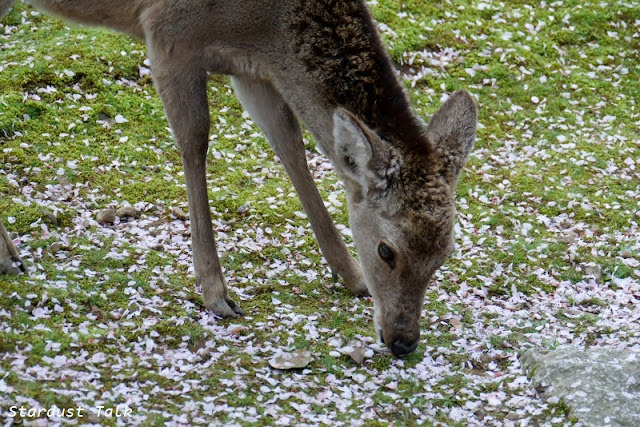 I would like to be those lucky deer stepping silently on fallen blossoms. Special thanks for the names, I do love the way the sound! Sakura fubuki is delightful. Living in accordance with Nature is the truest thing. Sometimes in daily routine, when you are overloaded with work it seems difficult. Yet, even a short walk on a starry night or newly-born moon like now, revives your feelings. I wish that little cute fleur of yours bloom happily, she is blessed to have loving parents and Grandma. Dr. B sends you his greetings. Hi, Irina! 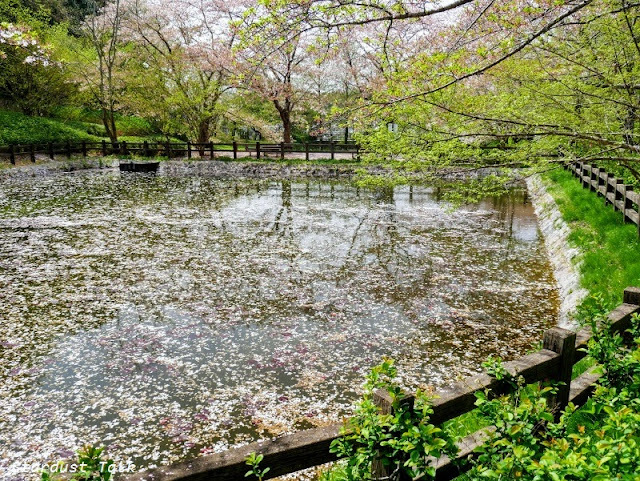 We stopped by Sagi-ike Pond but we didn’t walk that path (connecting Marumado and Sagi-ike Pond) as we headed for the opposite direction, though I don’t know if you strolled on your own the previous day. 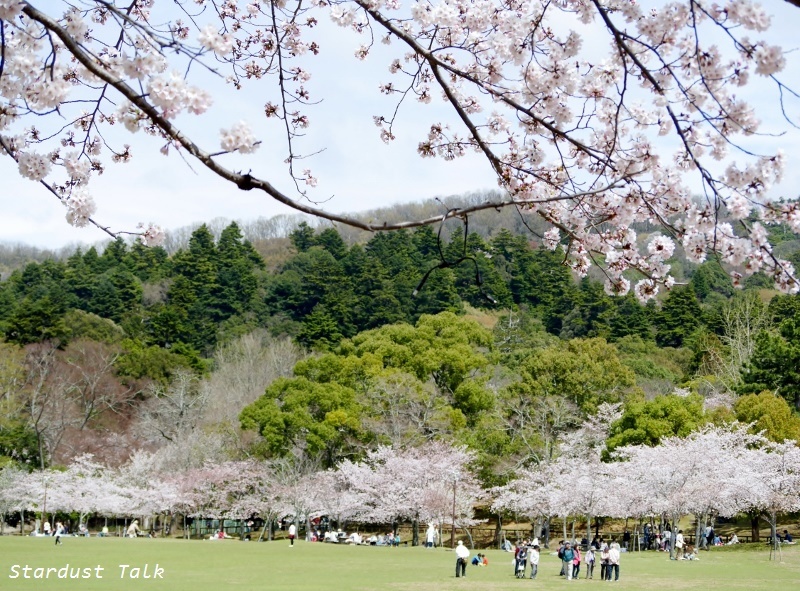 It’s so special to see the bare tree suddenly burst out in full bloom and come back to life all over Japan. 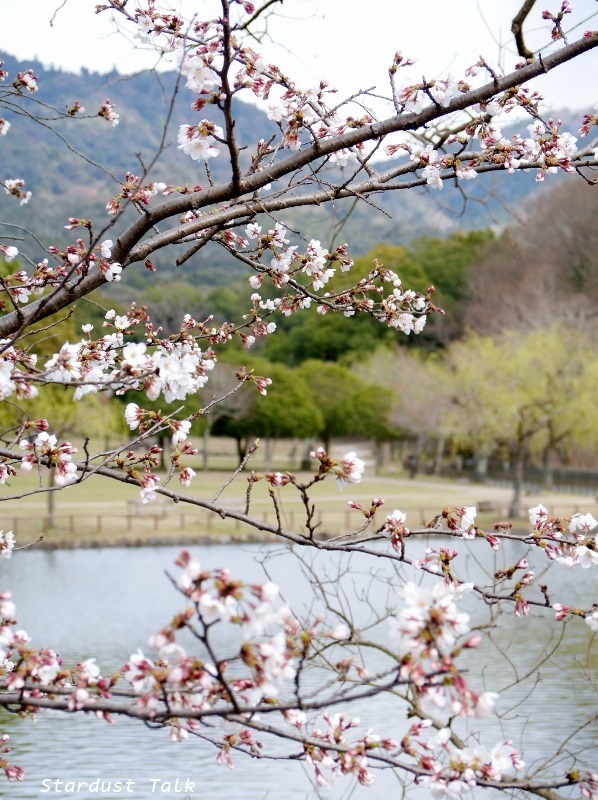 How about returning in spring after your retirement? Your photos just left me speachless.... it's such a stunning view. I wish one day I would be able to visit your beautiful contry at this time of year! Gorgeous! Every picture here takes my breath away. The season of Sakura is beautiful not only for its visible beauty but also in the message of transience that it gifts us all with. To hear it all in your lucid expression is always such a wonderful blessing, dear Yoko. 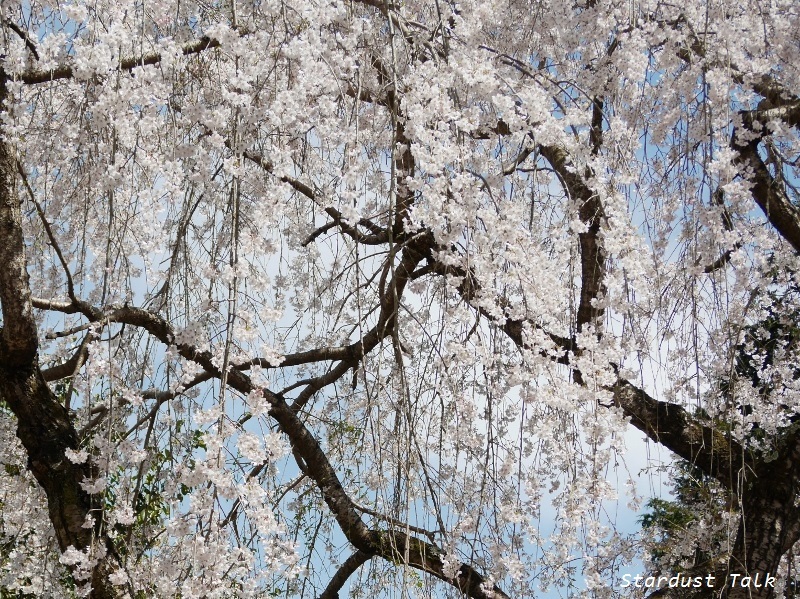 I carry the whispers of Sakura in my heart. So adorable, Y, such a joy to see her radiating in her pure innocence and smiles. Much love to her. And a lovely little girl !!! 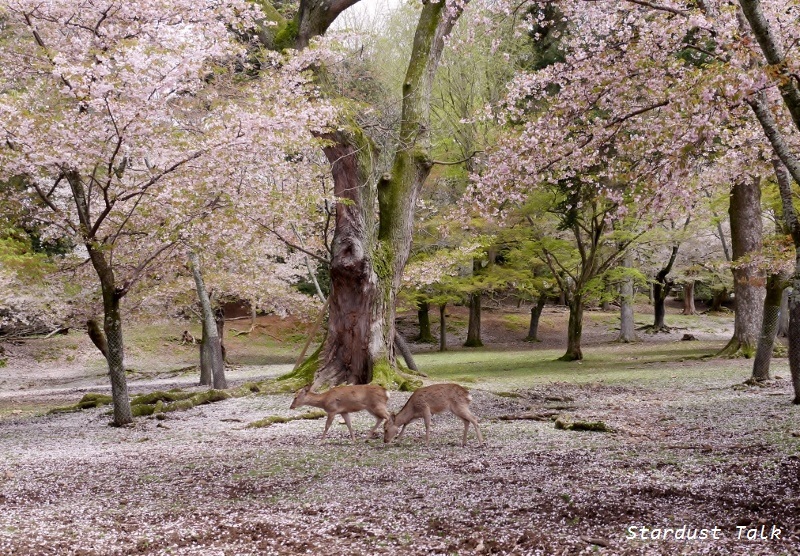 Thanks for sharing what you see in your beautiful Nara ! Gorgeous! Like in a fairy-tale! 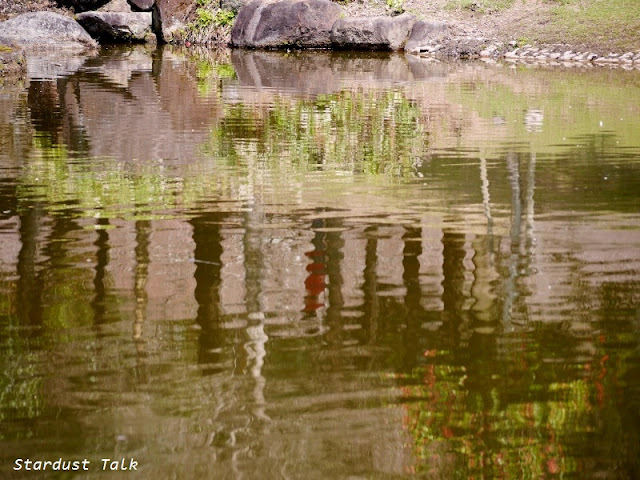 Thank you Yoko for this incredibly beautiful post.....each image is more lovely than the next. Fascinating video,especially the part when petals float on water - pure enchantment! Y is indeed a bright spark with a playful sense of humour perhaps? You are so right,we must treasure each precious moment. Wonderful nature which is renewed every year Yoko. Great photos !! I can only imagine how beautiful it must be to walk there in person. Your photos are so lovely. I had trouble reading the text over the dark background. Beautiful post, so lovely pictures like fairytales illustrations! Greetings in April! she is so cute. born into a magical world. Preciosas fotos, me encantan. Te sigo desde ahora !! 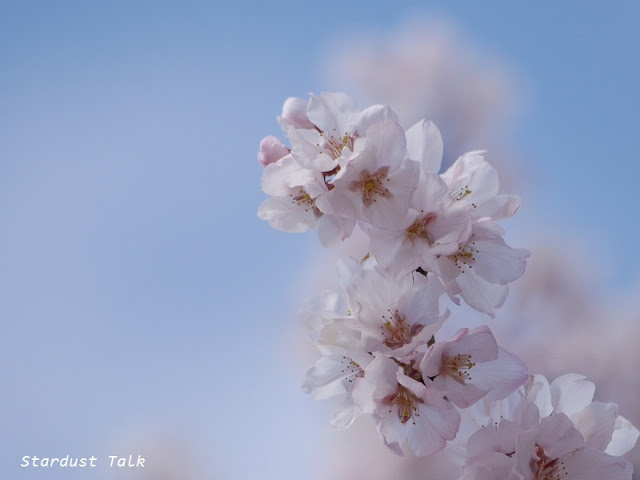 Dear Yoko, Your words and photos uplift my spirits as they bring smiles and tears.The transience of the blossoms helps us appreciate the fleeting nature of life. 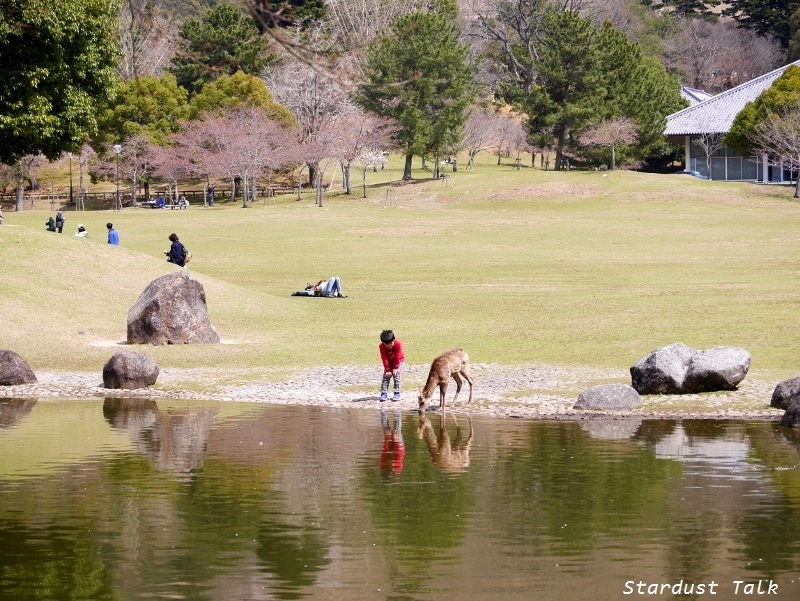 The reflection photo of the little boy and the deer is quite wonderful. It looks as though they are gazing at each other in communion. It is snowing here in Breckenridge, and I'm pretending that the flakes are Sakura blossoms I see floating to the earth. Your little Y is now as old as Sam. Three is a wonderful age of discovery with many new skills learned each day. 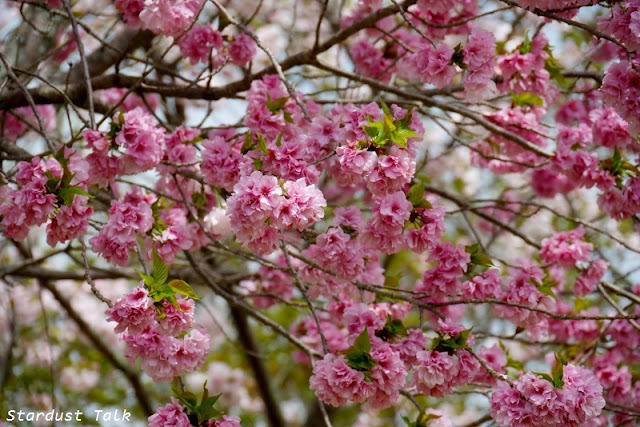 We are lucky to witness their blooming! Hi again stardust, I hope this finds you well. I have been hearing about the earthquake in Japan and although it was likely not in your area, you came to my mind. These horrific events make me wonder if this is the start of something greater for all the “ring of fire” regions, including my location in coastal BC. I am curious if anyone in your world talks about North Korea bomb testing possibly triggering earthquakes in sensitive areas not only in China and South Korea but also in Japan. Thank you for your concern. I wrote to you privately with my new address. Hope it didn’t go into junk automatically. Wow ! Brilliant pictures ! Your little granddaughter Y is so sweet. We are so lucky to be grandparents. I feel sad for my mother and father who only knew my older son for a few years, and never knew my Younger son. 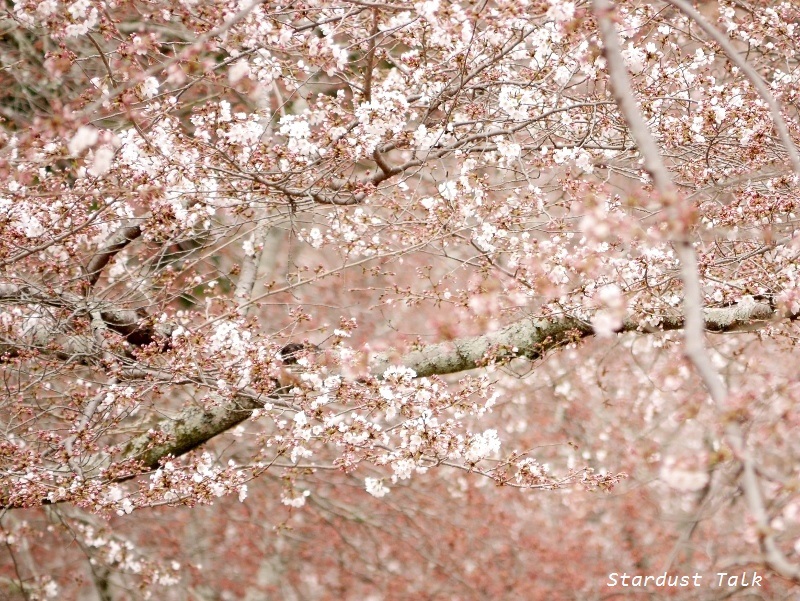 The sakura is so beautiful. No blossoms here yet, too cold, but we have a sunny day today April 16. I hope you are safe, I have seen the destruction caused by the recent earthquakes. Thank you for your concern. 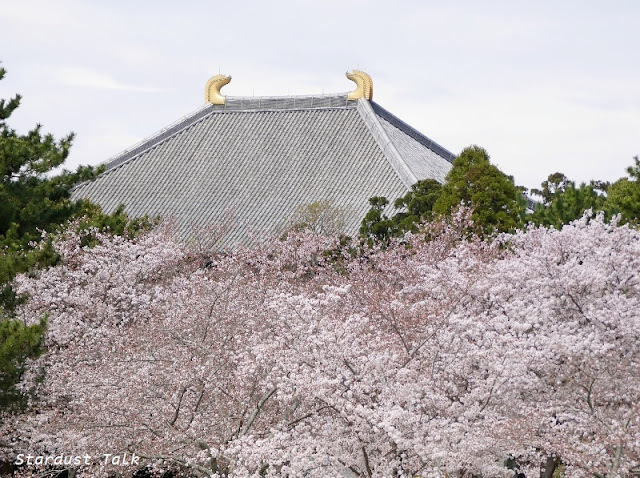 Though Nara is not affected by that earthquake, I’m in a sombre mood to think of those who lost their lives or those who have spent sleepless night in fear of many strong aftershocks. I stopped by again to enjoy your lovely flowers. We don't have many flowering trees yet, soon though. 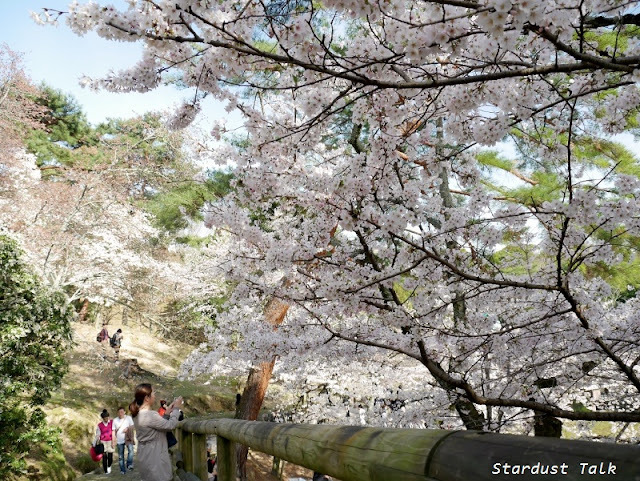 I might have to take a drive in a month to visit the cherry blossoms. Ours are on private lands, not a lovely park like yours. Lovely week to you. What a surprise, Yoko! I am charmed with drawing and painting. I look for materials for it in my free time and I like the Japanese felt-tip pens Sakura. Now I know the meaning of this word and, every time I take one of these felt-tip pens, I´ll remember this marvel that here you show us. 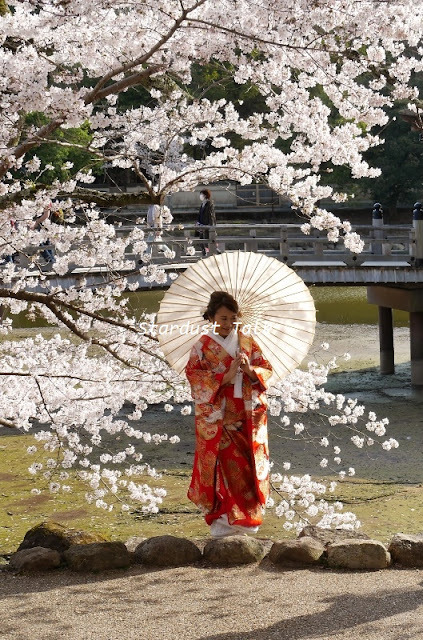 These photographies and the video of the flowers of the cherry-tree are a pure delight. As the tuning in between human beings and deer that it appreciates in your images.